Toy cars may seem small, when compared to Audi R8, which has a price of about $ .130.000. But if walking on the track, remote control car is capable of reaching speeds of up to 303 kilometers per hour. The speed is even higher than the Ferrari 288 GTO Classic. Toy car, named the R / C Bullet, is handmade. And dai material made of the same components with the Formula1 race car. This car is made from carbon composite, complete with aerodynamic, to obtain the desired speed, also has to get tested in the wind tunnel, everything looks like a real car, only small size. 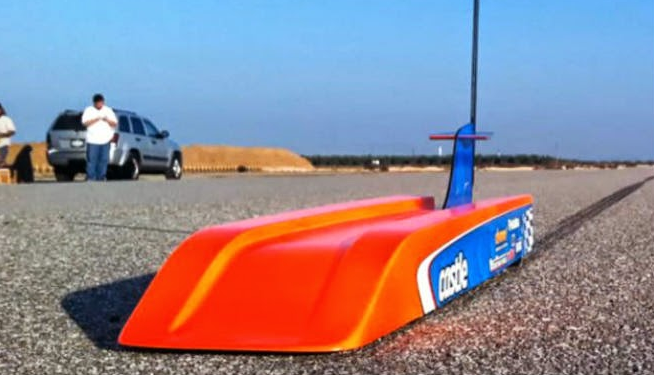 With a length of 60 centimeters, this car has a world record for a radio-controlled toy category. Even the sound produced from this car, similar to the large size of the racing cars. This toy car is made in a radio-controlled toy company Nic Case in southern California.